Brown with black and white legs, the mouflon is a colorful sheep with coarse hair hiding a woolly undercoat and white ears, nose, belly and rump that originated in Corsica and Sardinia. Mature males turn black on their lower neck and white in the saddle patch on the back. Males have thick and ridged horns that usually complete only a three-quarter circle. Typical horn length is 20 - 29 inches. 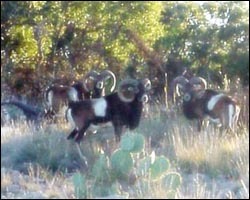 Available to hunt year-round, Mouflon males typically weigh 90-120 pounds, with females weighing in around 77 pounds. They are very aggressive around each other. Breeding time is from October to December, with a 5-month gestation period.